Attending as the Chief Guest at the 52nd Central Solung Celebration of the Adi Community, here at Giidi-Notko Chief Minister of Manipur N Biren Singh called for fostering and strengthening ties between Manipur and Arunachal and North East as a whole through the promotion of cultural exchanges. He said that Arunachal and Manipur have a rich culture and heritage manifested in the dances, songs and Festivals of the various tribes and communities, which symbolizes the spirit of unity in diversity. He invited for participation of cultural troupe from Arunachal in the upcoming Sangai Festival in Manipur and also extended his invitation to the Chief Minister of Arunachal and his team. The Manipur Chief Minister said that Arunachal Pradesh is one of the fastest growing states of the country in terms of performance and development. He lauded the Chief Minister Pema Khandu for his deep commitment, sincerity and hardwork for the development of the state. He said Arunachal in two years has taken giant step towards development and would be difficult for state like Manipur to catch with such pace. Earlier, the Manipur CM also released the Solung Souvenir. Khandu in his speech thanked Manipur CM and Dy Speaker K. Robindro Singh and MLAS and Guests from Manipur for joining in the Solung festival of the Adi Community. He said that this is maiden visit of the Manipur CM to the State on the festive occasion of the Solung Festival while adding that that we must continue such efforts for strengthening the ties of the sister states of Manipur and Arunachal Pradesh in various areas. The CM also termed Adi Community as one of the most progressive tribes of the state and educationally advanced in a state as the rays of education reached the Adi belt earlier, which is a matter of pride in a state which has been a late starter in the education sector. In the coming days GoI will be investing a lot for development of Pasighat as Smart City said Khandu and asked for proper planning to achieve the goal of truly Smart City in targeted timeframe. Under Prime Minister, Narendra Modi, major incomplete works like ALG has been completed, many infrastructural and other developmental initiatives in connectivity, health and various sectors are under progress. The CM also condemned Bandh Culture, which he said was already creating lots of hardships for the people, destructions of public assets adding that precious lives are lost as emergency patients are unable to get Medical care due to Bandh. Creating Law and Order problem is not a solution he emphatically said, while calling for debate and constructive methods. He said that State Government has undertaken various initiatives and reforms to bring transparency and accountability and also referred to govt decision for recruitment through Staff Selection Board. The CM also categorically stressed on Zero Tolerance to Corruption. 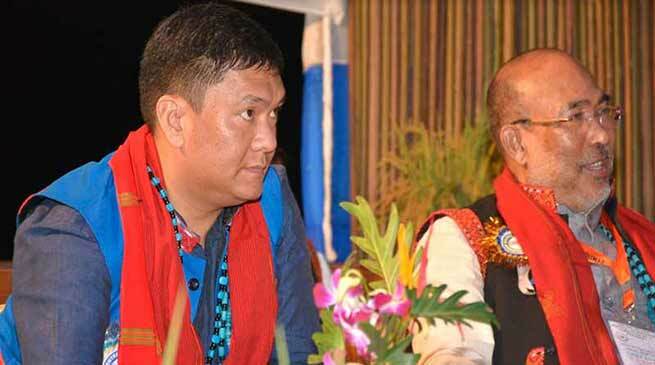 Deputy CM Chowna Mein, also extended his festival greetings to the members of the Adi Community and others in general, on the occasion and remembered the contributions of the pioneers of the society, who contributed immensely for the development of the Centurion town of Pasighat.